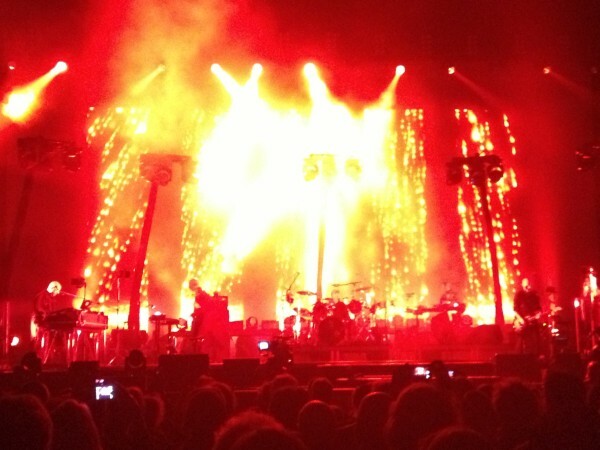 Of course, Peter Gabriel requires no introduction if you are a music fan right, otherwise, where have you been? This is the ‘Back To Front: So live’ tour, which celebrates the 25th anniversary of the 'So' album. Boasting an all star musician line up of Manu Katche, Tony Levin, David Sancious and David Rhodes it promised to deliver. Add in two amazing backing singers, Linnea Olson and Jennie Abrahamson for a concert experience that did deliver on all sides. Peter Gabriel, being the humble and personable human being that he is introduced the support act, who turned out to be the two backing singers in his band. The two girls mesmerised the audience with a combination of stunning vocals and cello mixed with slightly electronic dark beats and piano. Peter Gabriel has always chosen to sing with exceptional vocalists like Kate Bush, Paula Cole, his own daughter and these two girls are no exception. Linnea has a solo record out called ‘Ah’. After three songs, the rest of the band came on stage with a gentle acoustic start which built up the atmosphere nicely rather than changing it as many ‘rock concerts’ do. 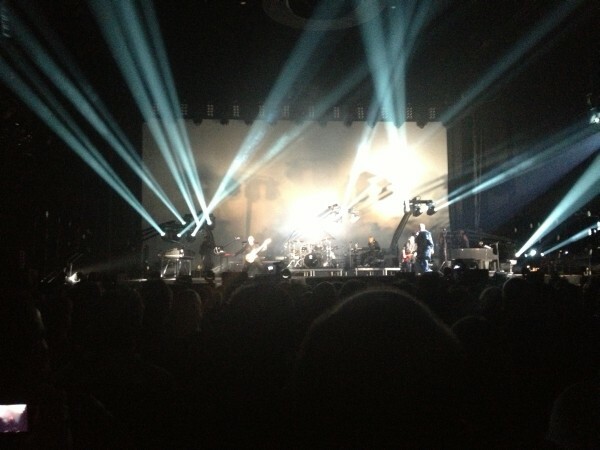 The main lights remained on whilst Peter Gabriel spoke Dutch to the crowd adding a very personal feel. The evening was in three parts and the set list was variety of music from the back catalogue, ‘So’ in it’s entirety and an encore. In the first acoustic part we were treated to tasteful renditions of ‘O but’, ‘Come Talk to Me’, ‘Family Snaphot’ and even an acoustic version of ‘Shock the Monkey’! David Sancious playing accordion added some depth and flavour to the sound. Peter Gabriel is well versed in taking his own and other artists’ music and reinterpreting them, from his ‘Scratch My Back’ and ‘And I’ll Scratch Yours’ albums. Moving to the ‘Full band’ section unleashed the electric might of the musicians playing the back catalogue songs. A few songs seemed to go unrecognised by the audience, who were surprisingly quiet during ‘Games Without Frontiers’, but erupted into hysteria and dancing on hearing the hit, ‘Solisbury Hill’. I do recall Peter Gabriel saying that there was a new song in there somewhere, as I didn’t make a definitive set list whilst I was there. 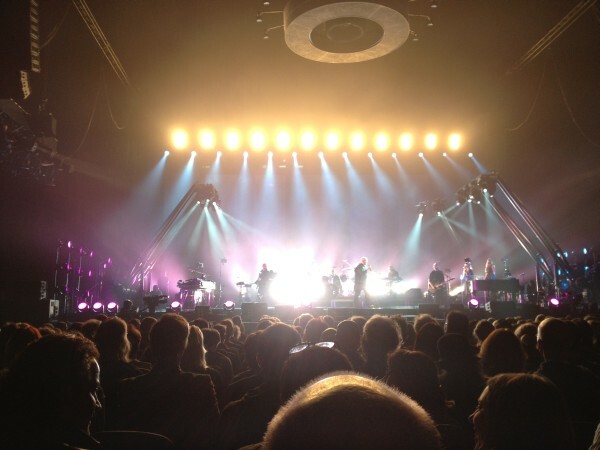 With all Peter Gabriel shows, there is much choreography with musicians, lights and sound involving his extensive road crew who are present on stage and deserve special mention. Some of the stage lights were on wheels and hoisted up on extension arms, manually operated by his road crew dressed in boiler suits and gas masks, which was actually was quite spooky. The lights could have resembled ‘Day of the Triffids’ or the cover of Jeff Wayne’s ‘War of the Worlds’ album cover with Aliens/Martians choreographed stage moves. With these visible effects and some of the eerie Peter Gabriel songs from the early albums, they created a real atmosphere that many artists simply don’t bother to think about. The band move to play ‘So’ –as Peter Gabriel said at the end, played as it should be, i.e extra tracks from the original LP and in the correct order. The familiar ‘Red Rain’ starts and Tony Levin is playing bass and keyboards with his ‘funk fingers’, ( cut off drum sticks with rubber ends attached to his fingers), but in the silhouette of stage lights, wearing a cape the long fingers it looks like Freddy Kreuger, but no one plays like Tlev! It’s a shame that the bass wasn’t really distinct enough in the sound. I can’t wait for the new ‘Stick Men’ album. Overall the sound was very good. Predictably, ‘Sledgehammer’ brings the house down where Peter Gabriel, Levin and Rhodes performed his Sledgehammer shuffle dance and twirls. I am sure that this will be great on the promised live DVD of the tour. ‘Don’t Give up’ –was undoubtedly be going to be a showcase for one of the girls to join Peter Gabriel and Jennie Abrahamson stepped up. What a voice, what a voice! The interplay on stage between Peter Gabriel and her acting was also fantastic. The band continued through ‘So’. ‘Mercy Street’ began with the band singing harmonies / acapella together and is another totally moving song which leaves you breathless afterwards. It reminded me how much contrast and depth there actually is on ‘So’, from brilliant ‘pop’ like ‘Sledgehammer’ and ‘Big Time’ to ‘Mercy Street’. The classic ‘In Your Eyes’ again showcased Jennie’s voice and brought the total involvement of everyone in the audience with those infectious rhythms and vocals that no one on the planet can resist moving to. Uplifting is the word I believe. The encore comprised of ‘The Tower that ate people’ and ‘Biko’ concluded the show.’ Biko’ as normal tears at your heart strings. “As always, what happens now is upto you”, said Peter Gabriel and at the end of the song leaves Manu Katche alone with the crowd to end the song. In another Peter Gabriel album review, I mentioned and still hold the opinion, he’s a true visionary out there in a league of his own. His music and artistry never stands still. A genuinely great performance and well worth the inflated ticket price. If you pushed me for a definitive moment of the evening, it had to be Jennie Abrahmson’s vocals as the support act whilst playing piano. Why Don't You Show Yourself? DPRP's Review of Peter Gabriel's "So"